We ended Part One with the execution of the man who Jane lived with for 18 months – she even considered him a father-figure, Thomas Seymour. In this article we’ll look at her life after her wardship. In order to continue with the life of Lady Jane Grey we really need to look at the events occurring in England at the time, and delve a bit further into the relationship between Edward Seymour, Duke of Somerset and John Dudley. To keep all these people straight while telling this story, going forward, I will try to refer to Edward Seymour as ‘Somerset’, John Dudley as either Dudley or Northumberland, Thomas Seymour as both Thomas and Sudeley. Edward Seymour, Duke of Somerset would soon discover that his involvement in the downfall and execution of his brother Thomas would be his own undoing. Was it Dudley who created a division between the brothers to pave way for his own ambitious plans? Did he hold a grudge against Somerset for stripping him of the title, “Lord High Admiral”? Not only stripped him of it, but Somerset gave the title to his younger brother, Thomas Seymour, Baron Seymour of Sudeley. Was that the so-called move that Somerset made to gain such vengeance from Dudley? Sudeley had always been an ambitious man, with ideas of what he saw as fair. The life he lived turned him into a well-liked, attractive man who behaved as a middle child would behave- always wanting more and striving to be noticed. As a middle child I can attest to this. Is being ambitious so bad? Nowadays one would be applauded for being so driven, but history has not been so nice to Thomas Seymour. If Dudley instigated any strife between the Seymour brothers I do not know, but his actions later definitely show that he was on a mission to be the most powerful man in England – what would stop him from getting everything he wanted? In February 1549, Somerset was in discussions with Henry Grey about a possible marriage between his son, Edward, Earl of Hertford and Grey’s daughter Jane. While Somerset still alive it would have seemed an invaluable match to Grey, however, after his execution a match with Somerset’s kin seemed less appealing to Dudley. Around this time a match was made with Northumberland’s son, Guildford Dudley and Lady Jane Grey. A match that would benefit both families. Initially, for Northumberland, a marriage with Lady Jane Grey meant that his son would be able to secure the dukedom of Suffolk after the death of Jane’s father. At that point in the plan it doesn’t appear to be all about making Jane Queen of England. After the execution of his friend Sudeley, Henry Grey aligned himself with Dudley. What was it that Dudley had said to him to get him to ally himself against the Lord Protector? Did he say that Somerset had lost all his power? Did he tell him of his plans to be Lord Protector himself? Did he go so far as to tell him that he wished for Jane to be Queen? — We know that Henry and Frances Grey were thrilled when Sudeley offered a marriage between Edward VI and their daughter – making her a queen consort and raising the station of their family. What would stop them from being motivated to make their daughter a queen regnant instead? Religion played a big part in this all. The idea of a Catholic on the throne was terrifying to the Protestants and they did whatever it took to ensure Mary Tudor would never became queen of England. On the 29th of November 1549, Henry Grey’s relationship with Dudley became beneficial to them both. Dudley with the persuasion and power he had was able to get Henry Grey appointed as a privy councillor. This appointment shifted the balance of the council in favor of those who agreed with Dudley. In February of the following year (1550), Henry Grey was appointed as one of the six lords who was personally responsible for the king. With this new appointment, the Grey family was now living at the court of Edward VI. The fate of Somerset became similar to that of his late brother, Sudeley, who was executed in 1549. Somerset had been surrounded by men who were whispered in his ear and warned him of his brother’s behavior. They convinced him that he had no other choice than to sign his brother’s death warrant, if he did not his own safety and the safety of the king would be in jeopardy. Four months after Sudley’s execution, a rebellion broke out in East Anglia. The commoners were protesting against the enclosure of land and the misuse of power by their landlords. —- In July 1549, a group of rebels destroyed newly built fences that were placed there by the wealthy landowners. One of the landowners was a man called Robert Kett. Kett chose to agree to the rebel demands instead of fighting against them. He then offered to lead the men. In July 1549, Paget wrote to Somerset: “Every man of the council have misliked your proceedings … would to God, that, at the first stir you had followed the matter hotly, and caused justice to be ministered in solemn fashion to the terror of others …”. It was Somerset’s reaction to the rebellion that cost him favor — after the rebels managed to occupy Norwich, Somerset wrote letters where he sympathized with the rebels and offered them pardons -he even stated he would bring up their grievances in Parliament. Unfortunately for Somerset, a man who was trying to compromise with the rebels, the king’s privy councilors were outraged by his actions. It was decided that Dudley, a seasoned-soldier, would lead an army against the rebels. He did, and on the 27th of August stopped them in their tracks. Dudley did what Somerset could not. Somerset had become a huge liability to the country. With multiple rebellions and the cost of war with Scotland, the rest of the council had lost faith in him. The council needed to act quickly, and formed a united front against Somerset – the group of men who had once been his allies and had approved him to become Lord Protector, now placed all the blame directly on him for all the events of the last year. They realized that, like Henry VIII used to do, they could make men and break them. That is indeed what they did to Somerset. On the 11th of October, Dudley was raised to Duke of Northumberland and Henry and Frances Grey were created Duke and Duchess of Suffolk (finally inheriting her father’s title after the death of her brother) – Five days later, on the 16th of October, Somerset and dozens of his supporters were arrested. After his arrest, Somerset was no longer Lord Protector. Historian Eric Ives did not believe that the downfall of Somerset was by the plan of Dudley. The fact that Dudley gained power was merely a coincidence. While I respect the late historians views I do not agree with him. In my opinion, Dudley wanted more power from the get-go. After the death of Henry VIII he found a way to wedge himself between the two Seymour brothers, the uncles of the king, and became instrumental in the downfall of those men. After the “dethroning” of Somerset (so to speak), Dudley made peace with him. This was an intelligent move by Dudley because the Duke of Somerset was still the most senior duke in all of England. Somerset still wielded a lot of power and money — with those two things he was able to hatch a plan to retrieve his title. As with Mary, Queen of Scots and her long battle for her queenship, Somerset always believed it was his right to watch over his nephew and no one else. That is what became his downfall. It is also what caused Mary’s demise as well. Both lost their head for their pride. As soon as Somerset fell from favor, Henry Grey immediately joined sides with Dudley and helped to bring down his former friend. Somerset was executed on largely fabricated charges, three months after Dudley had been raised to the Dukedom of Northumberland in October 1551. In all reality, Somerset only had himself to blame for his downfall – if he had not rebelled against Northumberland (Dudley) he may have had a much longer life. With that being said, Northumberland later admitted that the charges against Somerset were flimsy at best, but he knew how to massage them to get the result he wanted. This was a popular method in Tudor England. Since Somerset never ceased being popular with the general populace, it was Northumberland who had an uphill battle to climb to gain a positive reputation after Somerset’s execution. His reputation had gotten so bad that the Spanish were claiming that he was planning to marry the Lady Elizabeth. Side Note: The death of Somerset saw Jane’s family gaining a new home, at the Charterhouse at Sheen. Who put the king in mind to make the said articles, or who wrote them, or any of them, or by whose procurement or counsel they were made, or by what means he and others were called unto this matter, he knows not; but he thinks in his conscience the king never invented this matter of himself, but by some wonderful false compass. The unhappy king – born to disaster, and subject to abuse and plunder from both his guardians, first by his dearest uncle, the duke of Somerset, then as if from the frying-pan into the fire, by Northumberland – dared not make any protest, but fell in with the duke’s wishes; he soon ordered the most skilled lawyers to be called to note his will, or rather that of Northumberland, and to write it with all the ancient legal elaboration. Northumberland’s plan was to use the same method as Sudeley – convince the young king that he should outright and flatter him with lots of decision-making. Although Northumberland overthrew Somerset, it was the method of the King’s other uncle, Sudeley,that Northumberland modeled after with the young King. I’ve always believed that King Edward was sheltered from his role as King by his uncle Somerset, and Sudeley saw it and tried use it to his benefit. When the King’s health began to fail Northumberland knew, if he wished to keep his powerful position he had to find a way to protect himself in the event the young king should die. A warrant dated the 24th of April 1553 is the first indication we have of a betrothal between Jane Grey and Guildford Dudley. The warrant was for ‘wedding apparel’ to be delivered to both the bride and groom. On the 25th of May 1553, Durham House, Northumberland’s residence in London was witness to a triple wedding. Jane Grey to Guildford Dudley, Katherine Grey to Henry, Lord Herbert (who had been brought from his sick bed to wed Katherine) and Katherine Dudley to Henry Hastings. All three marriages were advantageous for the Dudley clan and either brought them closer to the Grey family or other noble families in the realm. The weddings were quite the spectacle to be seen and a majority of English nobility showed up to witness them. There were jousts, a feast and two masques performed. We don’t know for certain how Jane felt about a marriage with Guildford. He had been described as ‘a comely, virtuous and goodly gentleman’. Whether or not Jane fought against the marriage is a grey area – some have said she fought against it, while others say that went along with the process because she knew it was her duty. The marriage would join the two prestigious families of the Greys and Dudleys, and would be celebrated in all the glory as one should if they had royal blood. Unfortunately, the King was ill at the time and was unable to attend. In his place he sent gifts of ‘rich ornaments and jewels’. The imperial ambassador wrote that the wedding was being ‘celebrated with great magnificence and feasting at the duke of Northumberland’s house in town’ and it extended over two days. After the wedding feast, several attendants, including the bride and groom, fell ill from food poisoning. The source of the food poisoning is believed to have been a salad. It is said that the cook, “plucked one leaf for another”. Jane Grey suspected her mother in law was responsible for the food poisoning. The coupled lived apart for a while after their wedding. But, by the time Jane became Queen of England they were living together at Durham House and had certainly consummated their marriage. Was the rush of their wedding because the Edward’s ‘devise for succession’ only named male heirs? All that remained were women and they need to have a son….and fast. Jane’s relationship with Guildford appears to be a very interesting one. They were both young and Guildford was still a mama’s-boy. I believe, from all that I’ve read, that Jane did care for and maybe even loved, Guildford. There were already rumors that King Edward was dying, but on the 28th of May 1553, Edward’s doctor privately informed Northumberland that the King would not survive past autumn. It was not long after Northumberland was made aware of the poor health of the King that the French showed their support to stop the succession of Mary. The death of the English king was on everyone’s mind — Edward’s successor could easily throw off a balance of power in the world. Everything appeared to be playing out just as Northumberland had planned. King Edward adjusted his will to pass over Frances Grey (since she had not had male heirs) to her daughter Jane and her heirs male. This wasn’t the first time that Frances Grey was overlooked – Henry VIII had done the same thing to the daughter of his favorite sister. According to the papal envoy (Giovanni Francesco Commendone), Northumberland was the one who informed Jane that she was now heir to the throne of England. Jane, understandably, was upset – not so much that she was taking away something from her cousin, Mary, but that her own mother was overlooked in favor of Jane. Upset, Jane requested to go back to Suffolk Place to see her mother, however, the Duchess of Northumberland denied her request since she needed to be immediately available upon the death of the king. Jane had found her voice over her short years and wasn’t about to allow the mother-in-law she did not like to dictate what she could and couldn’t do, so Jane snuck out of Durham house and took a boat on the Thames to see her mother at Suffolk Place. While Frances consoled her young daughter who would soon be queen of England, Guildford’s mother was furious that Jane had snuck out. She threatened to keep her son away of Jane if she did not immediately return. Such action would be cause for a public scandal. The two families came to some type of compromise and Jane returned to her husband’s side. It wasn’t only Jane who was upset that her mother was passed over, Henry Grey was livid about what had just transpired and was now convinced that Northumberland merely wanted to have his son on the throne all along. While all this drama was playing out, King Edward VI slowly prepared for his death. 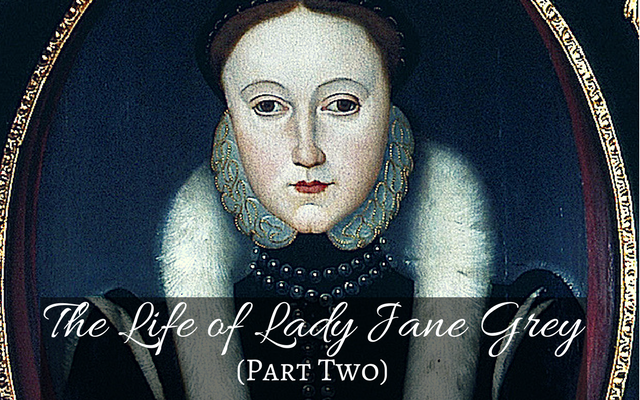 On the 21st of June, after a long time of considering who would succeed him he declared that his ‘half blood’ sisters were still illegitimate and would not be eligible to succeed him – his successor would be the Protestant Jane Grey. On the 27th of June, after rumors had spread that the King was dead, Edward VI made a point to show himself at a window. This was the last time his subjects (outside the building) would see him alive. Only six weeks after her arranged marriage with Guildford Dudley, Edward VI had died and Lady Jane Grey was proclaimed (by Northumberland) Queen of England. De Lisle, Leanda. ‘Three Sisters Who Would Be Queen‘. Ives, Eric. ‘Lady Jane Grey: A Tudor Mystery‘. Tallis, Nicole. ‘Crown of Blood’.